Rays of the sun are gently touching waves of crystal blue sea. Light breeze is slightly rustling the straw-covered umbrella. From the vibrant streets nearby, pleasantly sweet aroma of orange peel is flowing and it is hilarious to hear roar of traders at the market. No stress, just peace and quietness. So. What will we invest in today? 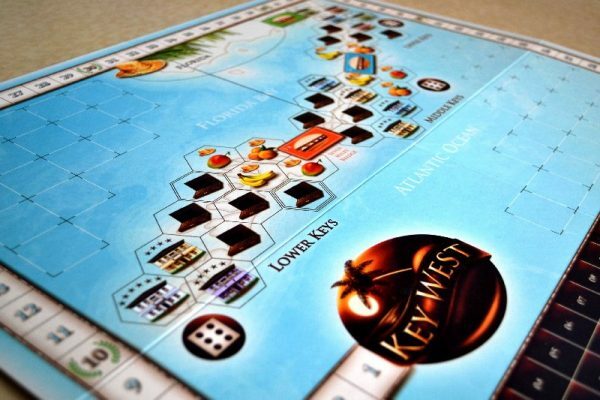 What is it like to grow rich on tourism, whilst enjoying the sunny beaches, can be re-lived in a board game from Martin Schlegel, which was named simply Key West. 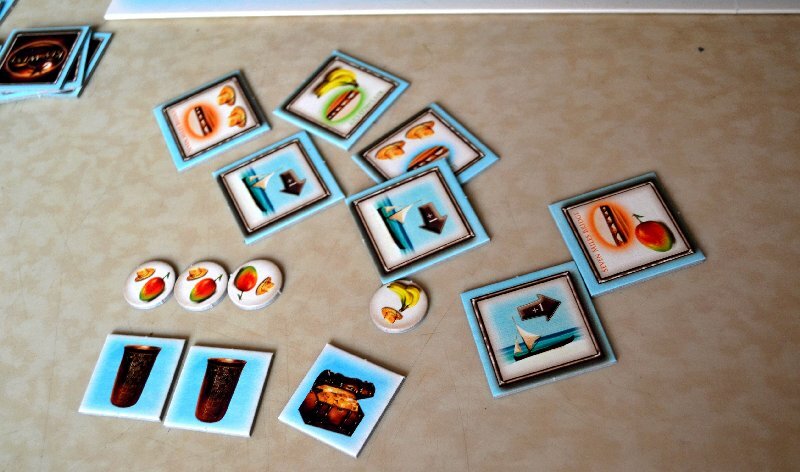 Illustrations of this game were done by Cosimo Tassone and is was published by not much known (in our part of world) company Idee für Spiele. Box itself immediately flows with colors, evoking good and relaxed feeling. 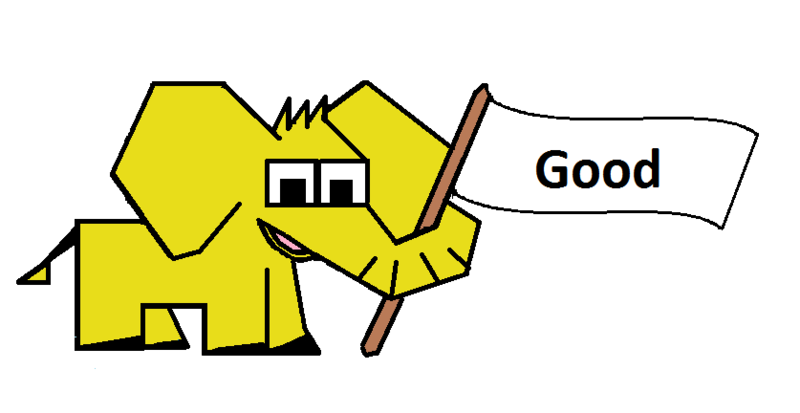 It will prevail even in the actual game, but we will get to that a little bit later. Now we open this box with a nice feeling and we look on brief description of its content. 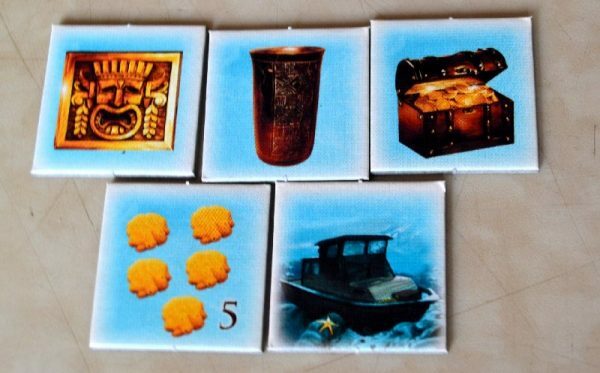 You will find a row of wooden tokens in five different colors (depending on number of players) and then a large number of cardboard tokens. Among them are are those with sea back, which will serve in the exploration of the deep mysterious waters. There are also action tokens with the inscription Key West reverse, which finds its use at the beginning of each round and are used to gain different advantages. What economic game would it be without money? They are done also from cardboard. 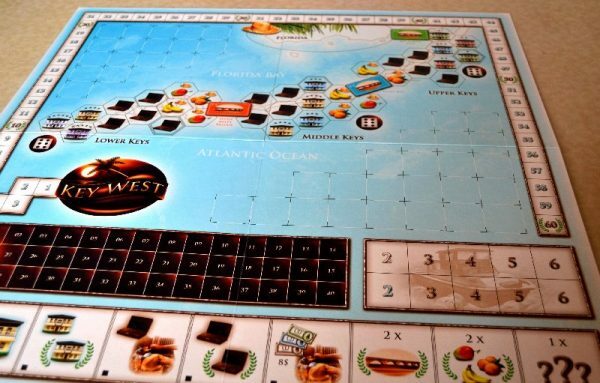 At the very end awaits us a game board showing all three islands. Each of them is equipped also with one wooden dice. Scuba diving tokens are spread across the board, action cards are sorted into 7 piles and bridges should connect islands with each other. They are covered with predetermined number of banknotes, and then it comes to determination of first player, dealing staring finance to players and game itself may start. Each game round begins by auctioning action cards. Six action cards from one pile is turned face up, so all players, know what they will have to work with. Auction itself is very interesting and quite innovative. First, players secretly choose amount of money they want to spend and then all at once open their palms with money. Highest bidder has right to choose first action token. He then selects next highest bidder and so on until the last – the one, that offered the least, does not get any pieces. Instead, he gets as many money tokens, as he himself offered up for auction. This money are given to him by winner of the auction. It figures, that although it is usually preferable to have first choice from action chips, sometimes it also pays off to deliberately offer the least and therefore get pretty rich. Money, that players put up for auction, are immediately returned back to their owners. This means, that besides winning auctioner, no one loses anything. Thanks to these action tokens, players can occupy new plantations, participate in construction of bridges connecting the islands or get some advantage for diving. After the auction itself, its time for game round. 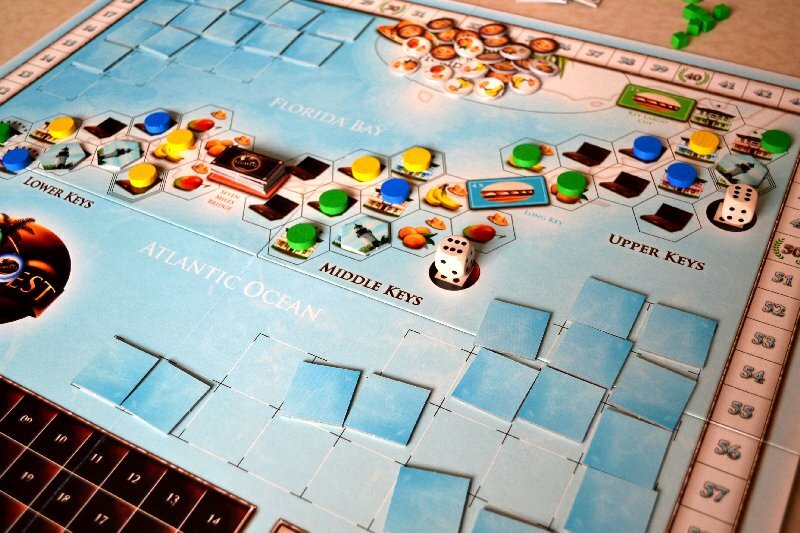 Each player has two action points, that can be spent on a variety of events. These actions are initially carried out by one player and only then it goes further. Each event offers a completely different strategic options and paths to victory points. A player in these action placed cubes of his color. They had to remain there for three rounds, so that player cannot use it for the upcoming two rounds, because he blocks it with his own cubes. First and very interesting opportunity to gain valuable points is by performing diving event. It allows you to secretly look up to three tokens with sea back and take one of them. With the help of improvements, you can get more than one chip or you can dive for longer time and therefore rotate more cards. 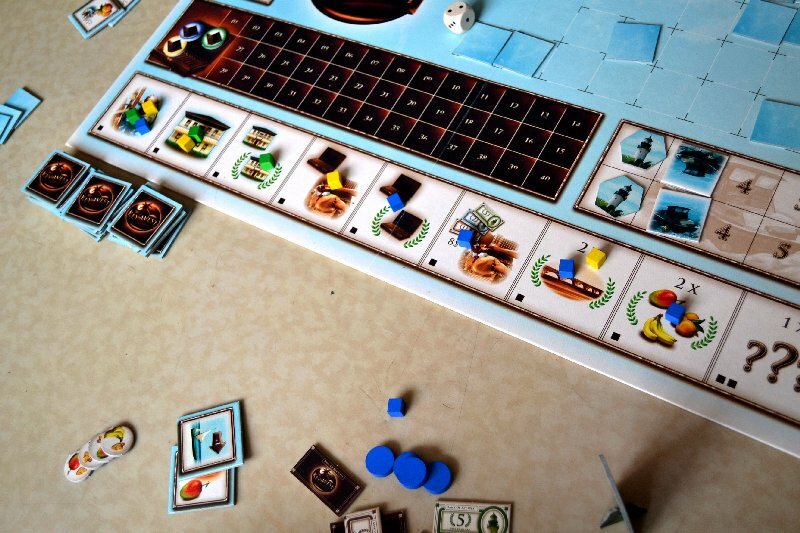 In the depths of the sea, you can find mushrooms for money or rare artifacts, that can bring a lot of points. But you need to find more specimens of the same species. 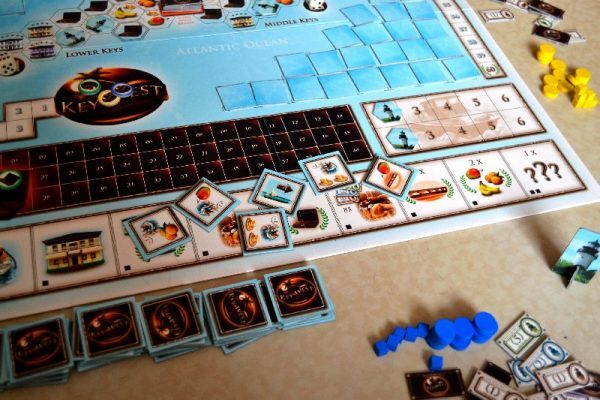 When you are discovering secrets of the underwater life, you also might encounter shipwrecks, the more are found, the more discoverer gets points. Sometimes it pays off to wait. An integral part of tourism are of hotels. Players can buy them through second action. Hotels can not be used until there is a bridge from the mainland. To opening the first island, it is enough to build only one bridge, while third can be visited by tourists after positioning of third bridge. 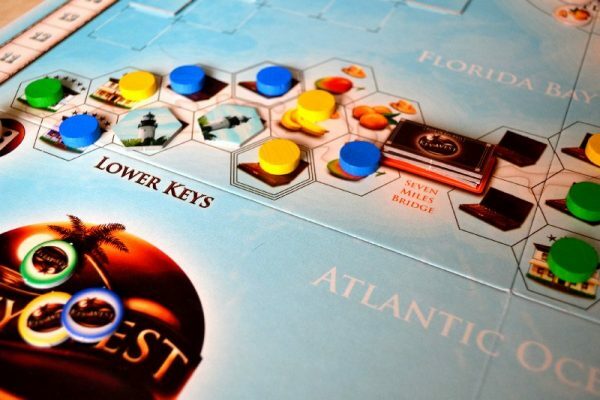 Purchasing hotels is therefore better on the first island, because it opens much earlier. 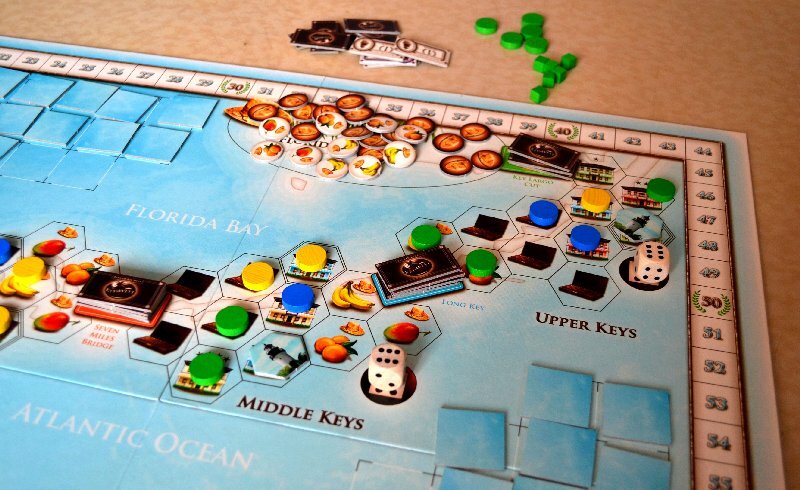 But final score will count with hotel stars and the more valuable with more stars are on two remote islands. 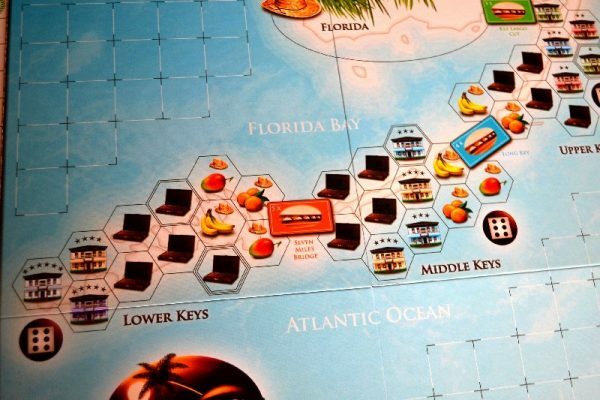 Hotels, however, bring money and victory points during the game. For this purpose is there third action. Player rolls the dice only according to how many islands are his hotels located on. Highest number rolled is multiplied by the number of active hotels. 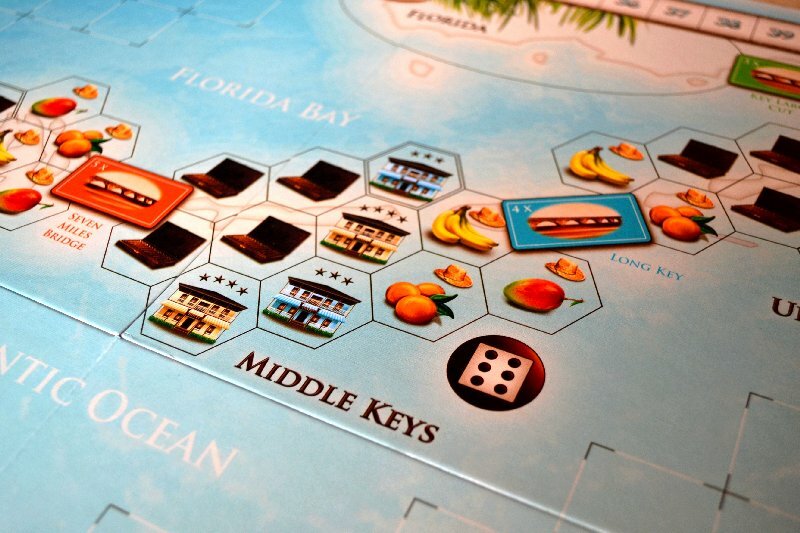 This implies, that it pays off to have hotels on more islands to increase the likelihood of high rolls. Fourth action allows gamers to buy a cigar factory and also produce them. Again the more islands own cigar factory, the greater the number built. Unlike hotels, cigars are produced in all factories. 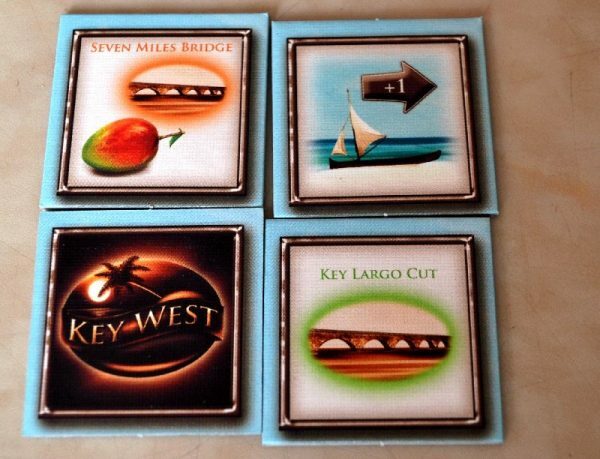 Players can for further action receive a number of victory points for their shares of built bridges, get instant money selling cigars for victory points or grow fruit plantations. Fruits get players a decent supply of points, if they manage to collect more pieces of one kind. As stated above, cubes of colored players remain on the action for three rounds. When a player wants to re-use an action, that is blocked and does not want to wait, he can spend new two action points for repeating it once. In this way, the whole game continues until eighth round is completed. 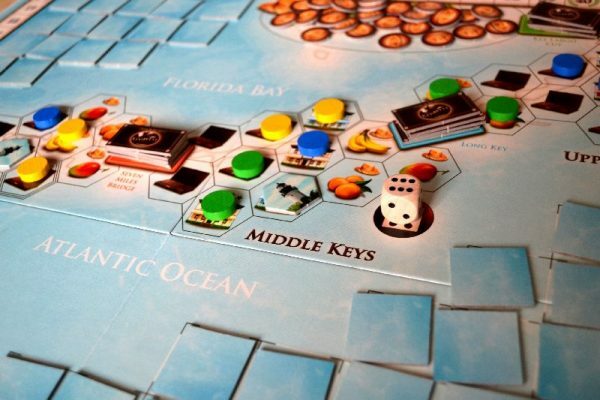 Then, players receive victory points for their harvested fruits and artifacts taken from the sea, for remaining bills, and ultimately fat amount of points is awarded to player, who owns most luxurious network of hotels. Hunt for stars is paying off right in that moment. Player, who got furthest on the scoring track, of course, wins. 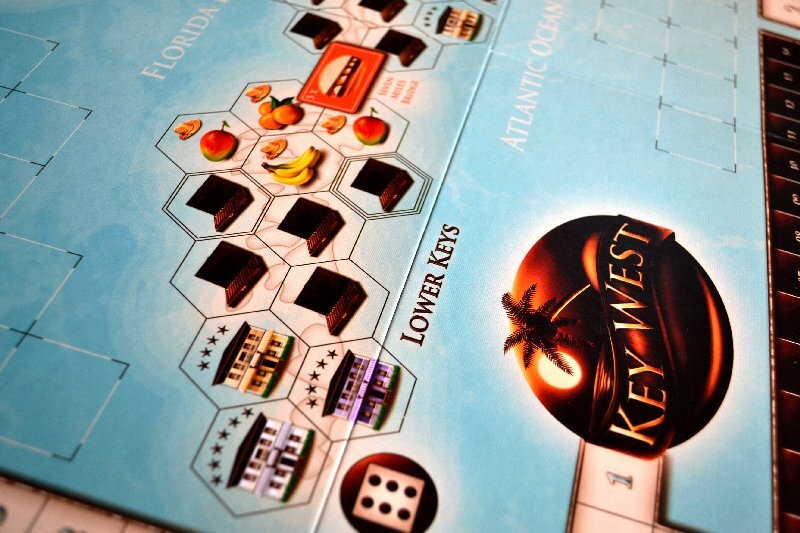 Key West is a game of economy, so first and foremost, it is important to manipulate with money well. But it is nicely wrapped up in the guise of entertainment in the form of auctions, that are really good. Using the familiar mechanics of secret betting is also inflected with auction victor paying money to whoever bet the least. This makes the decision about how much to put into the auction even more complicated and exciting. Action tokens are in fact usually very strong weapon for the way to victory, but in most cases, it is better to finish second or third, so you do not have to pay anyone. Ah, but where is the magic threshold? How many bills will be enough and how many too much? Similar dilemmas offer key components of game, which are available actions. Every single option is offering a unique path to victory. Player can therefore always take a completely different way. Unlike other strategy games, where choosing strategy is mostly indirect and includes several individual parts, here choices are very clear and do not actually contain more deeper content. Just as shopping hotels does not endorse any other options. It is the same with all other actions, which tremendously lowers experience and diminishes it sometimes to almost childish fun. It is however necessary to emphasize last word of the paragraph above. 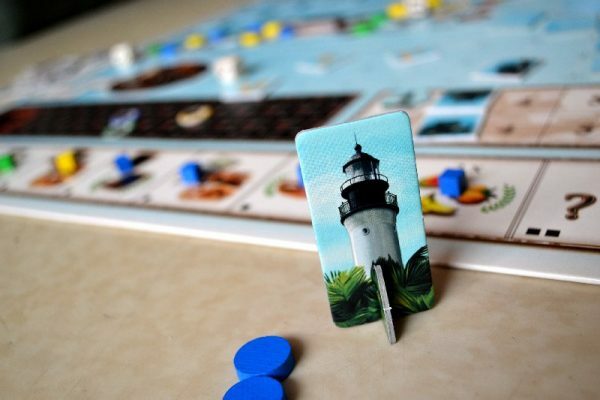 The game is real fun, mainly because of a family concept, where you get points quite often and you do not mix strategies, just focus on one of the them. And yet the game still retains a certain strategy niche, where you have to analyze your moves and think about if you block an option now, whether is would not be useful more later. Even though it is an economical game, it is not “dry”. 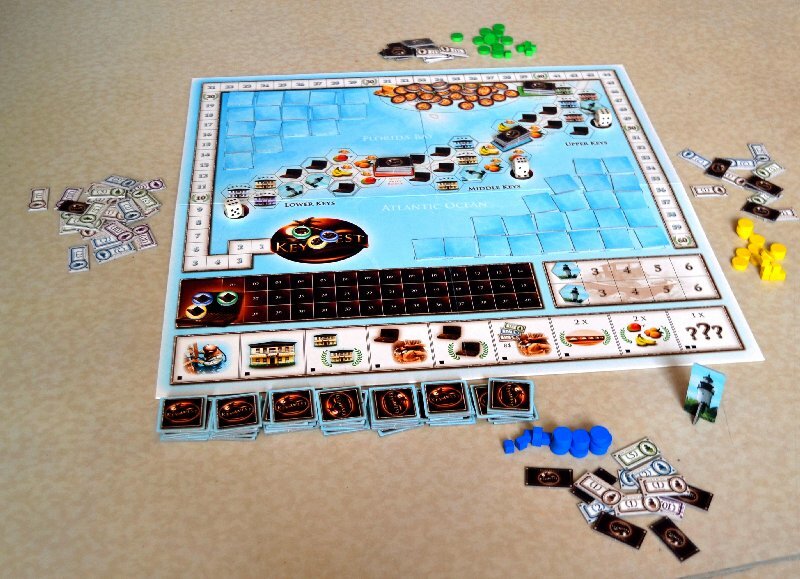 Auction succeeds in adding fun, focuses heavily on the interaction between players. It is a fact, that there are no dead spots in the game and you always know, what you will do and because of that, the game really is gripping experience. 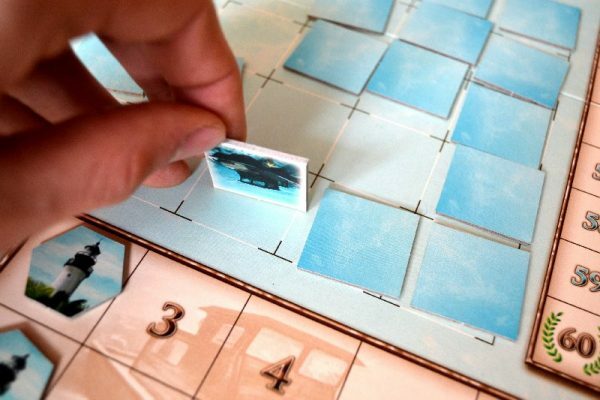 You will experience approximately the same game in any number of players, just playing time stretches proportionally with greater numbers and thus figure on the box does not quite correspond to reality. In three players, maybe. All in all, it is a good game, but suffers from various options being too straightforward and are also strongly influenced by chance. 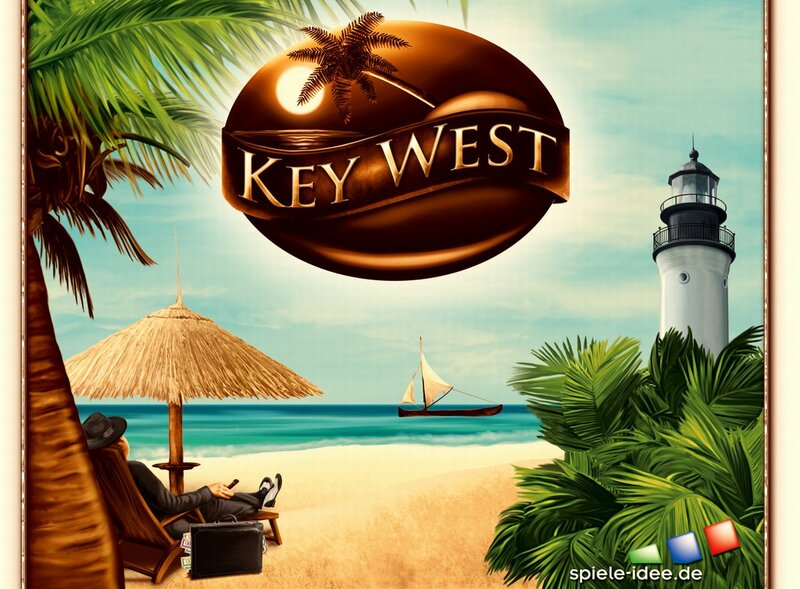 This is great shame for a strategy game, because Key West itself is a very entertaining game. Key West is entertaining economic game, which, thanks to rich and highly diverse range of individual actions, offers playing constantly new experiences all the time. Actual auction as original element ensures interaction between players and gives the game amusing feel. Unfortunately, due to the presence of too linear strategy, it becomes static over time and sometimes too easy. 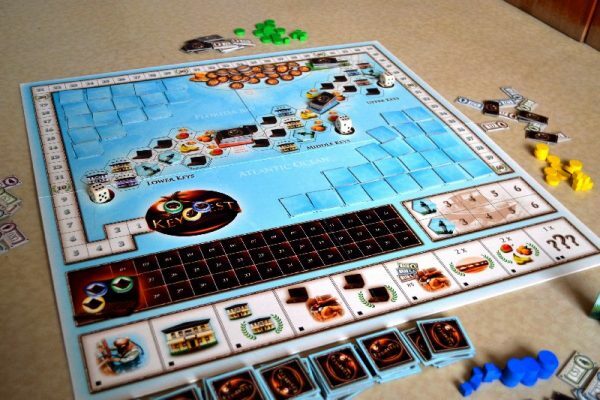 Fortunately, to players, who play board games for fun, will it not matter much, because they will not be bored.